* Mariell's regal wholesale wedding or pageant chandelier earrings feature a spectacular array of oval and teardrop CZ stones encrusted in pave CZ jewels. 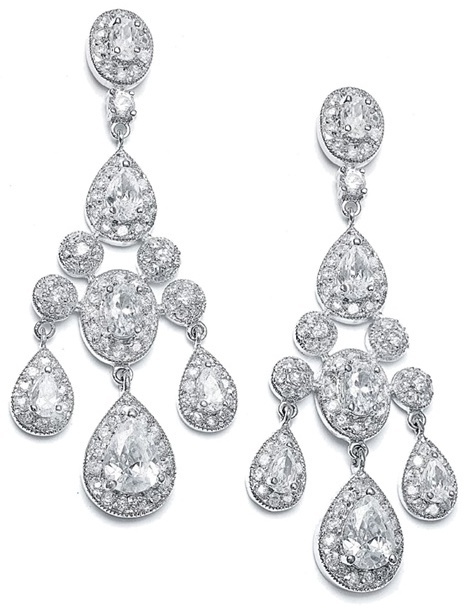 * Mariell's regal chandelier earrings for weddings or pageants are a spectacular array of oval and teardrop CZ stones encrusted in pave CZ jewels. * These silver rhodium wholesale earrings measure an eye-catching 2 1/4"h and are 3/4" w.